A three-sport standout in tennis, basketball, and baseball, Mark Hendrickson from Mount Vernon High School is one of the finest athletes from the state of Washington. During his sophomore year, Mark was a member of the state championship baseball team and the runner-up state basketball team. Mark was a member of the state championship basketball team during his junior year, where he earned recognition as the co-MVP of the tournament for his play. He was also named team captain, team MVP, and named to the All-Area and All-State teams. A tennis state qualifier, Mark was also named to the baseball All-Area team. As a senior, Mark led the Bulldogs to a second basketball championship. He was team captain, team MVP, All-Area, All-State, and the state basketball tournament MVP. For his performance on the basketball court, Mark was named the Gatorade State Player of the Year. In addition to his remarkable basketball play, Mark was able to help his team win the state championship in baseball, while also qualifying for state in tennis. He was named the Skagit Valley Herald Athlete of the Year both his junior and senior years. After graduating from high school, Mark made his way to Pullman, Washington, where he played basketball for Washington State University (WSU). He was named to the Pac-10 All-Rookie team his freshman year. Before graduating from college, Mark was named WSU MVP twice, WSU team captain, 1st team All Pac-10 twice, and among the top six in WSU history in five different categories. In 1997, Mark decided to further pursue his passion for basketball. 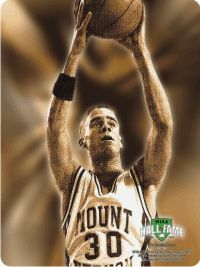 He was drafted 31st overall by the Philadelphia 76ers. Mark played four seasons in the NBA before making his move to Major League Baseball and is one of a select group of athletes to play two professional sports.